Two brothers. Luca and Sara. They are in love with a dream, so much so that they decide to abandon other paths and careers and to pursue it: wine making. Most of the vineyards they cultivate are the heritage of the dream of two other Carbone brothers: Enzo and Vittorio (Luca and Sara’s father), who at the beginning of ‘70’s choose two breath-taking sites, called contrada Monte Lapis and Piani dell’Incoronata, in Melfi, sow grapes and produce aglianico wine. Around the end of the ‘80’s the “old” Carbone brothers must take on other challenges, so they decide to keep on cultivating grapes, but they stop making wine, as they don’t have any more time to look after the winery. The pause ends only at the beginning of the years 2000, when Luca decides that he wants to be a farmer, with the strong internal commitment to avoid any other type of aspect (“at the most, i can take care of the winery as well…but nothing else!” he will fiercely vow) and Sara, who had already been living for a long time with the luggage under the bed, can’t wait to organize herself in whatever best way as to allow him to be what he wants to be. The result is a weird duo, always in deep discussions about which wines to make. On one thing they always agree: it is essential to work well on the vineyard, and it would be fatal to put into a bottle something that would not convince themselves. Their first aglianico wines are produced in 2005, together with the design of the plant for the wine making, of the hypogeal cellar, and of the new vineyards. Now they cultivate around 7 hectares, organic certified. The current production is about 25.000 bottles. 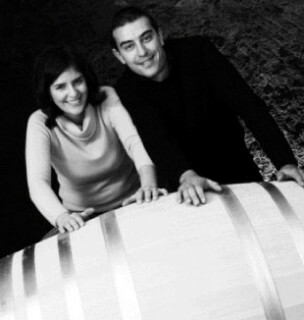 They are convinced that the necessary ingredients to making good wine are only two: good quality grapes, and time.